I’ve seen photos of Jardin Majorelle many times. It’s always struck me as an interesting garden, but not a ‘me’ garden. Too cactusy, too loud with its hard landscaping colours, not soft enough for me. But when you happen to be in Marrakech and find that something is the number one attraction on TripAdvisor, what can you do? As I’m sure you can imagine (you are much smarter than I am), I fell for it. In fact, Paul and I debated whether it was the best warm climate garden we had ever seen. After living in hot countries for eight years and with my appetite for garden visiting, this was clearly quite something. It’s one of those gardens that just works. As soon as you walk in you feel yourself relax and know that you are looking at a true work of art. A real expert has curated this garden. It all began in the 1920s, when the French painter, Jacques Majorelle, commenced his forty year project. A passionate amateur botanist, he created a luxuriant garden which is often regarded as his most ‘dazzling’ work of all. In 1980, when the garden was threatened by developers, Yves Saint Laurent and his partner, Pierre Bergé, purchased the property. They were equally dedicated to the garden, maintaining the cacti that Majorelle so loved but adding their own touches. Yves Saint Laurent said that he was able to find an unlimited source of inspiration in the Jardin Majorelle, something I can quite imagine. When he passed away in 2008, Bergé donated the garden to a Foundation, such that others could enjoy the garden indefinitely. The buds are little miracles of horticulture! The first surprise was that the majority of plants are plants you commonly see in Sydney. Clivia, Xanadu, Agave, Crassula, bamboo. Really, really common ones. And yet Marrakech has an average annual rainfall of 281mm, verses 1,213mm in Sydney and when you consider how absolutely desert-like the surrounding land is, flying into Marrakech, it’s hard to believe it could possibly have the same plant palette. I think we often get misled in Sydney. We know we get generous rainfall and so convince ourselves the lush, green look is sensible. Yet for most, the soil is sand-dominant, meaning that rain goes straight through it without passing ‘Go’. Jardin Majorelle showed that a lot of our common plants are sensible, but many others aren’t. It shows that beautiful, beautiful planting combinations can be achieved that don’t need total reliance on their owner. I continually wonder why this style of garden is still so rare. Just a bed of random cacti. But just look at the absorption of every observer’s face, as they stop in their tracks along the pathway. This is one special cactus garden. Succulents are a major feature in the garden, with cacti (a sub group of succulents that have areoles, such as spines) being particularly dominant. I’ve grown to love some succulents over the years, but cacti were never on my Christmas list. In a city with 281mm of rain though, how magnificent they look! Incredible yellow spotted cactus (centre). No, I appreciate that’s unlikely to be its latin name! I know I go on about sense of place, but could there be a better example of this? The first Moroccan garden I have visited in my life and yet it was clear as mud, Moroccan. It perfectly oozed Moroccan-ness. And it was this that made the garden work so well. I’d always thought that locations need time to find their sense of place, that English gardens were more English than Australian ones Australian, largely due to centuries of time. But this garden told me that when extremely talented artists set their mind to something, sense of place can be achieved instantaneously. The bold colours had always jumped out at me in photos of this garden. Just too much. But seeing the garden in person, they were spot on. They enhanced the sense of place; ‘Majorelle blue’ (a unique shade) reflecting the colour of the sky, and reds and yellows, the colour of Moroccan spices. All primary colours, forming a unified look and warming up the harshness of the succulents tremendously. They toned with the bright shades of the Bougainvillea and Aloe flowers and lifted the mood of the garden. 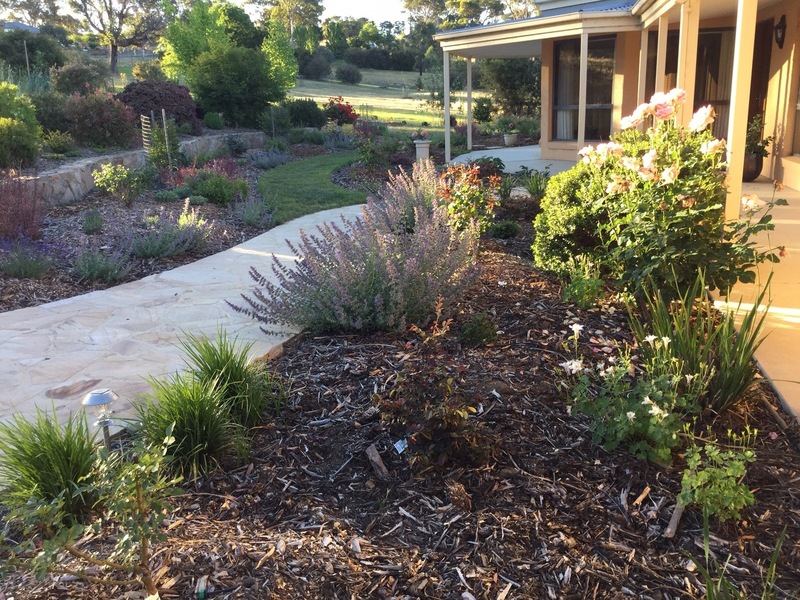 Dry climate gardens are often low to the ground. Taller trees need too much water and short, shrubby plants dominate. Most succulents are great examples. The magic of this garden was due to its enveloping foliage. Through the use of pergolas and clever plant selection, foliage wrapped around you on all sides and overhead. Not only does this allow you to leave the busy city behind you, but it creates a cool atmosphere and beautiful dappled light. It slows you down as you duck underneath trailing Jasmine and Bougainvillea. It feels like a complete oasis. And so I wonder. Why did I not like the garden in photos? Have I grown up or is it just one of those gardens that will always be much better to experience in real life? Perhaps you have the answer for me, seeing these photos today. I had a bit of cushion envy in the Boutique Majorelle. I can’t believe Paul thinks we have enough cushions already. I mean really, isn’t that impossible? Is my husband or the Bougainvillea more handsome, I wonder?! In this garden it is so obvious the designer wasn’t afraid (or ashamed) of the surrounding countryside. In fact he celebrated and reflected it by using hot colours in a hot landscape – yellow pots and red paths. I love them. How often do we read how we can make a hot garden feel cool by introducing cool colours? He ignored that and by using red and yellow brought the outside landscape into the heart of this oasis. Then he drew the sky in at eye level with the bright blues – blue is perceived as a ‘cool’ colour, but that is not the way it strikes me here in these photos – the blue is vibrant, stimulating! I too am not a fan of cacti but right plant in right place always looks right. He used plants, lots of greenery, cleverly, to cool the garden – even in the photos it looks cool. A bit like Paul! I love the way you have articulated that, Adriana. That they are celebrating the area’s uniqueness, as opposed to trying to be something it isn’t. 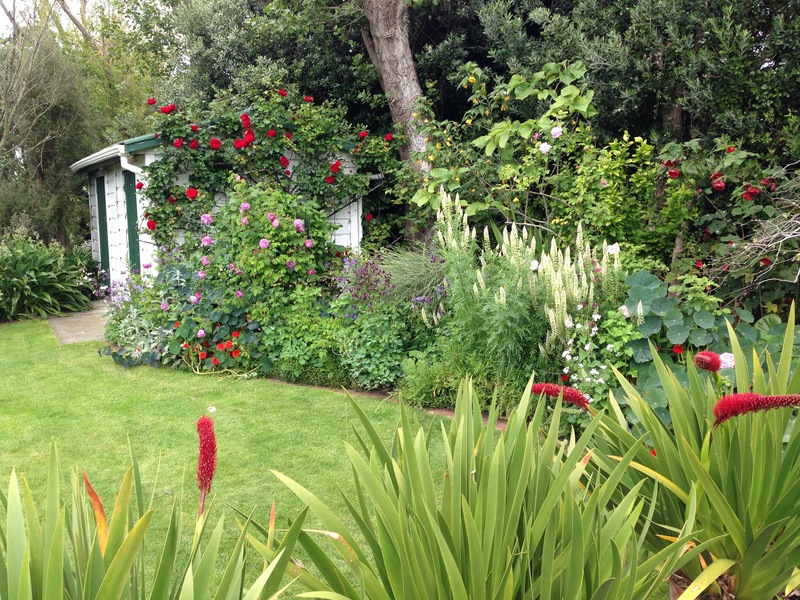 Oh, how we could use that bit of advice in so many areas, gardens being just one of them. And, indeed, the point you make that design theory is often too simplistic and whilst can be helpful as a guide, shouldn’t be taken too literally. Blue isn’t just blue. We need to open our minds to really harness creativity. This is definitely a garden that makes you think. What an interesting post. From images I have seen of the garden my opinion was just as yours at the beginning of this post. But I suspected I had missed something…that sence of place that you so eloquently extoll. This is why I asked if you REALLY liked the garden. Garden images usually don’t portray hot, dry harsh environments and glaring light like that in which Jardin Majorelle exists. I still find the fluorescent blue jarring, especially when used on large expanses but do like it in small doses, and I do like the use of the other primary colours. I find it interesting that the image under the heading of ‘succulents’ with a green painted pergola appears, to me, rather flat and ‘ordinary’ It goes to show that the bright colours are necessary. However I do not like the bamboo fences. To me they seem too light and delicate for the strong planting scheme and colours. But what an oasis! As usual your post has given me lots to mull over. One lesson that I have taken on board from following your blog Janna is not to be dismissive of gardens and plants that initially don’t appeal. It’s totally changed how I look at all gardens. Oh, and sorry Paul, I think my Bougainvilleas (all 5) are VERY handsome indeed. That’s a really good observation about the green pergola. I think the whole structure and framework of the garden was so well done that Majorelle (and his successors) have a created a licence for outrageousness! Hence why the expanses of blue looked OK to me within the whole context. That’s probably what is hard to get across with a collection of disjointed photos; there, you have helped me understand why it is perhaps a little different in real life. To me, the bamboo fences just looked natural, unobtrusive and almost transparent, rather than being a feature in themselves, but now you say it they are very different from all the other hard landscaping features. And yes, I do agree, your Bougainvillea are VERY handsome! Oh, you are so right, Jessica. Now could you say that just a little louder so that Paul can hear you? Good for you to check the garden yourself. I love the Jardin Majorelle, but I think, its too expensive for foreigners now (70 HD) and in the afternoon, its overcrowded. At 70HD (around £5-6) it is a little more expensive than some of the other tourist attractions in Marrakech, but I thought it was worth every penny. I suppose I am used to higher prices elsewhere. I just hope it is cheaper for locals, as I know they love it too. The look on our waiter’s face when we told him we had been there was an absolute picture; he clearly adored visiting the garden. We also went in the morning having read the reviews, so no problem with crowding. I’d certain recommend a visit to anyone visiting the area. I recommend a visit of Jardin Majorelle too. And you are right: the entry for locals and residents is a little bit cheaper: 40DH. Best and most complete review I have seen of this garden. Thank you. Gosh, thank you. I’m certainly not the first to review it. You’ve made my day! Sense of place starts with the plants. My two cents worth. Oh, such a great analogy and one that works for horticulture in general, I think. Just as you feel you’ve almost learnt the most important stuff a whole new ‘layer’ appears before your eyes and the learning process begins all over again. But isn’t that why it’s so compelling? !